Learn how to make delicious and comforting Daal: Indian Yellow Lentils by following my easy and simple tutorial. 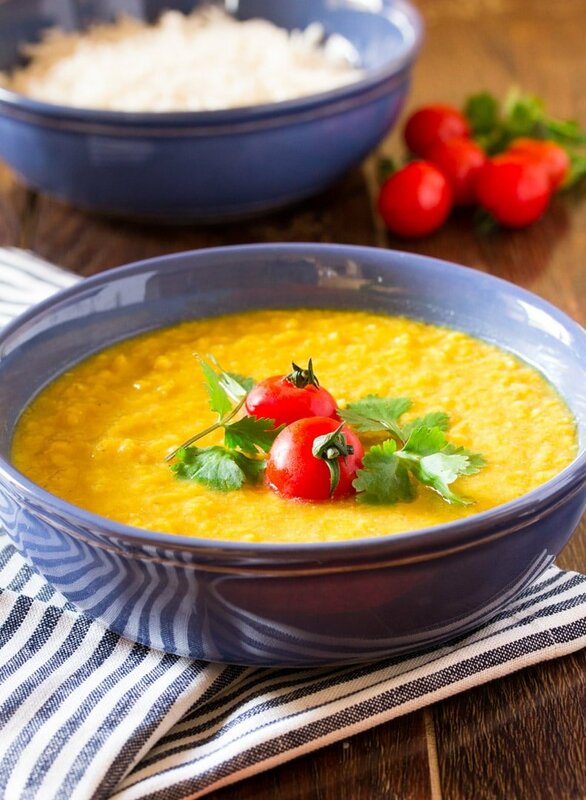 Read onto find tips for how to make the perfect daal and the many health benefits of daal. I remember whenever we would come back home from a long road trip / flight, my mother would go straight into the kitchen and within 30 minutes there would be a delicious spread of daal chawal, kebab and salad would be ready. Daal is a comfort food in most Indian and Pakistani households. And to date, it’s one of my favorite meals to make because it’s delicious and super easy to make. If you’re a regular reader around here, you must know by now that I don’t do difficult cooking at all. I’m probably the laziest cook in the world, and I believe that’s the way it should be. Food doesn’t have to be difficult to be delicious. And this Pakistani daal recipe is the perfect example of simplicity at its best. Now that I’ve told you how much I love this dish, let me show you how to make yellow daal. How Do You Make Indian Dal? There are many different ways to make Daal and each household in India and Pakistan has different methods and recipes to make daal. The beautiful thing about daal is that you can make it as simple as you want or dress it up with tadka (more commonly known as daal tadka) and pair it with white rice or roti / naan (Indian flatbread). The dal / daal that I’m teaching you to make today is the simplest I know of. 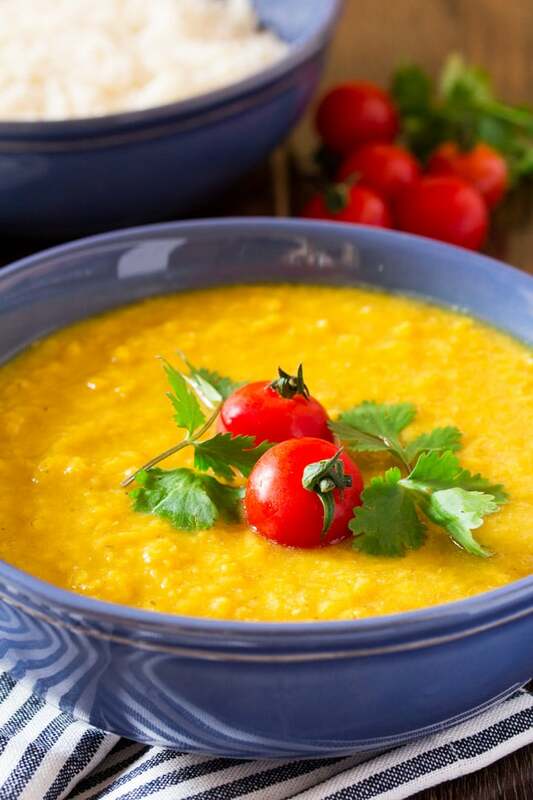 The recipe only requires one type of lentils : red split lentils also known as masoor daal lentils. This daal is often made by mixing two different types of lentils (masoor and moong) but I usually make it just using masoor daal, and it still turns out scrumptious. 1.) Soak the red split lentils (masoor dal) in water for 15-20 minutes or so. Drain. 2.) Transfer the daal to a medium sized pot, and add enough water so that it is one inch above the lentils. 3.) Add kashmiri chilli powder (laal mirch powder), turmeric (haldi) and salt. Boil the lentils until cooked. 4.) Once the lentils are cooked through, you can either garnish with lots of chopped coriander OR make a tadka and make this daal into daal tadka. The recipe that I’m sharing with you today is without the tadka because I wanted to keep things simple today. What is Dal Made Of? So what is Dal? 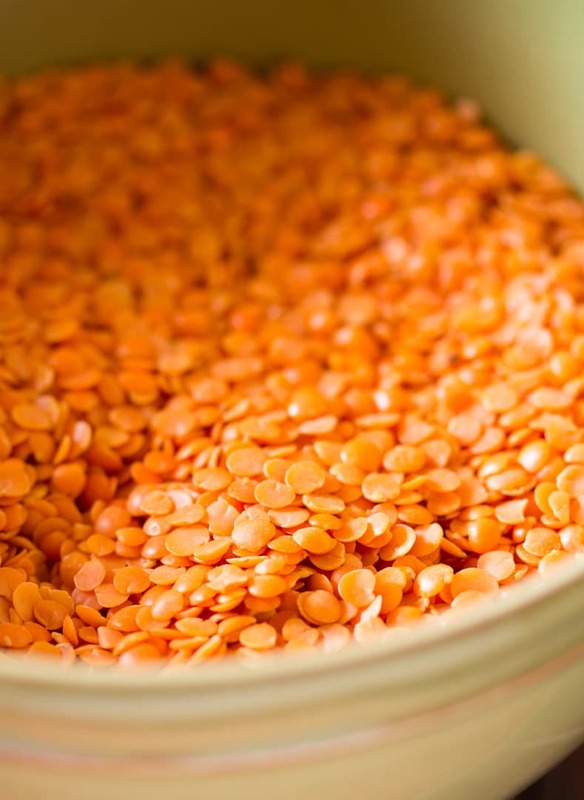 There are many different kinds of lentils that are used to make daal. But the most commonly made daal is made from Indian Masoor daal which is a salmon colored round lentil – also known as red split lentil. See below. Isn’t it a beautiful color? I like to call it pink daal because it’s easier to remember, hehe. However, once cooked, it turns into that bright sunny yellow color as you can see in the rest of the pictures. Is Dal Good for Health? 1.) It helps lower cholesterol. 2.) Daal is high in fibre so it’s good for the digestive system. 3.) Daal is also high in protein so it helps in keeping you full for longer. 4.) There have been studies that show daal helps in reducing risk of heart diseases. 5.) It’s great for weight loss as it is high in protein and fibre, keeps you fuller for longer and virtually has no fat. 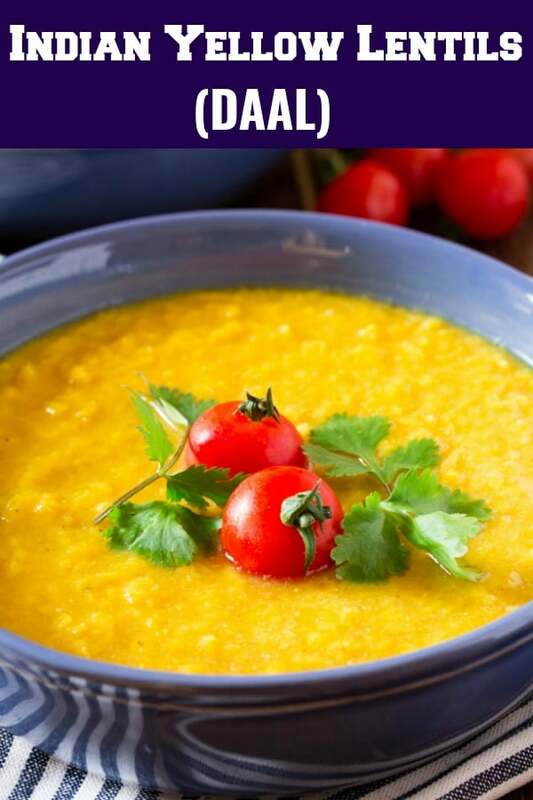 Learn how to make delicious and comforting Daal: Indian Yellow Lentils (masoor daal) by following my easy and simple tutorial. 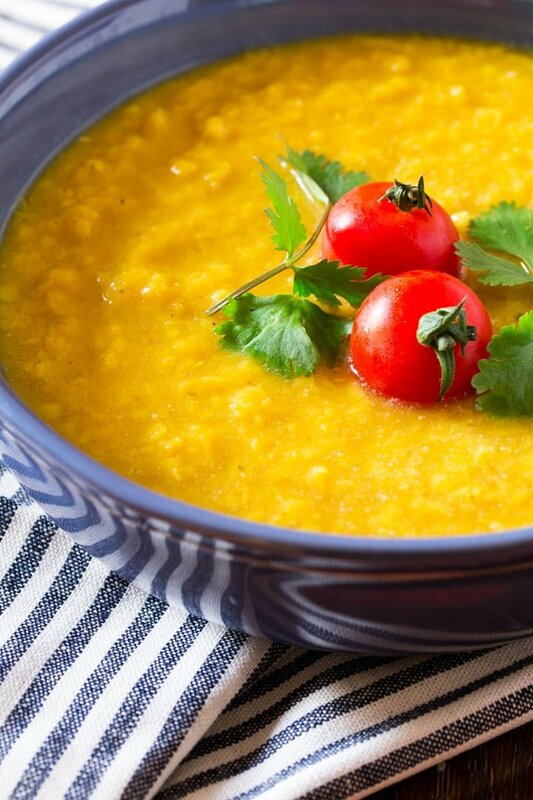 Read onto find tips for how to make the perfect daal and the many health benefits of daal. In a medium sized bowl, soak the lentils in water for 15-20 minutes. Rinse the lentils and transfer to a medium sized pot and add the rest of the ingredients: water, salt, turmeric powder and red chilli powder. On medium high heat, boil the lentils for about 30 minutes, while occasionally stirring. 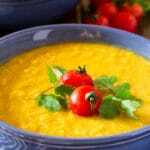 The consistency of the daal can be adjusted by adding more water if it's too thick for your liking. 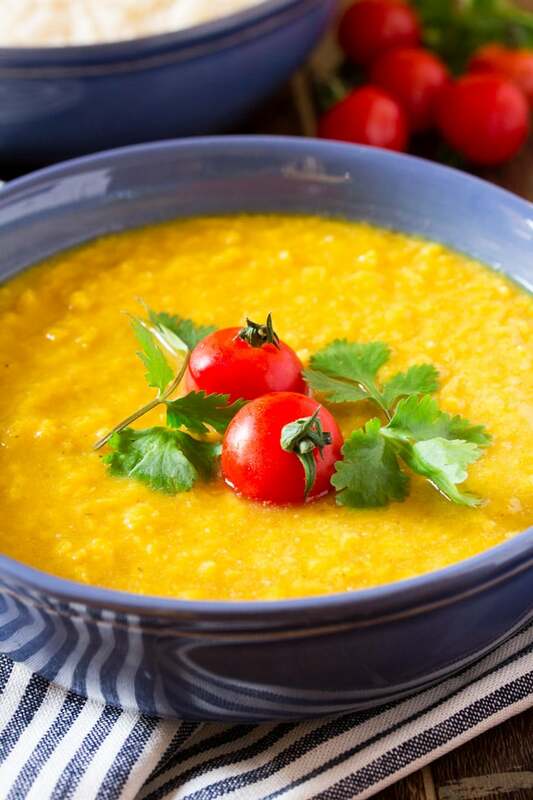 Finish the daal by adding a the juice of half a lemon and garnish with chopped coriander and tomatoes. Serve with plain white rice or naan / roti. This looks amazing! My husband is going to love trying a new dish! This is one of my favourite healthy comfort foods. It’s so cheap to make too. I always order daal when I eat out. I’m definitely going to have to try making it myself. Thanks for the recipe! I love lentils but have never made Daal. I bet I could use my Instant Pot. Breat pics! This looks delicious! Love the presentations and the beautiful tomatoes on top! I like how you made this using only one type of lentil. I usually don’t have many different variety of lentils at home so that would be helpful. This looks like it would be a filling addition to a meal. Thank you -This is almost a definition of simplicity. I love daal my recent discovery is washed moong dal (skin removed). Great to make a dal curry or dall khitchri or dal soup. But I love your recipe. Daal is a pretty rare dish to spot on so it is great I found it. It was also very informative to find out all the good things daal brings to your body. Sounds impressive! I definitely need to give this daal a try, it looks absolutely delicious! I love that daal was the first thing you made after you got married, what a great foodie memory that is. I’ve made daal before and I love it, but I’m sure I haven’t made the original. It still tastes amazing! I simply love dhal or daal – it was one of the first curries I ever made too – and this looks so so good!